It's a great time of the year to bring in a little touch of the garden. After cold weather or too much rain (or too little) in some parts of the country, wouldn't a little touch of living green add some warmth?! adds a bit of reflective light and show offs the rich green. vessel for some small succulents. moss, dirt and plants actually touching the silver can damage it. still get lucky and find a few silver pieces at a decent price. have some breathing room, and do not over water them! I planted them exactly the same as I showed in a previous post. 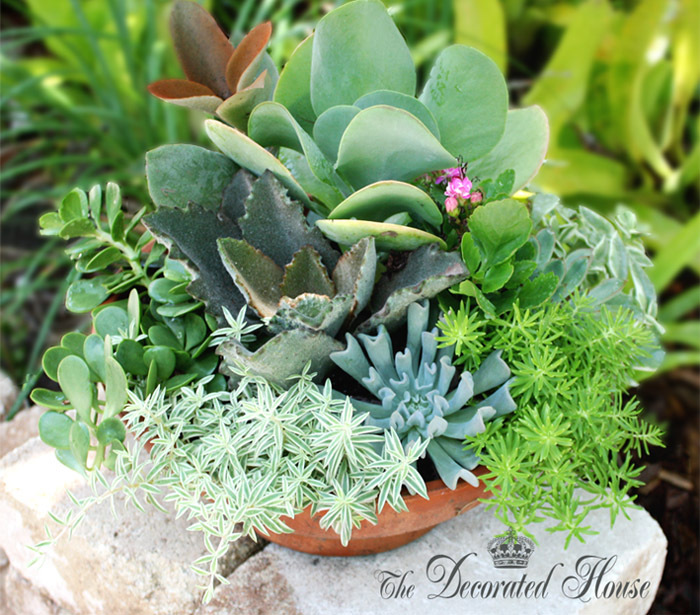 HERE :: How To Create a Succulent Dish Garden. wrap, then insert the succulents which I had planted in small peat pots. it will keep the moisture away from the silver. 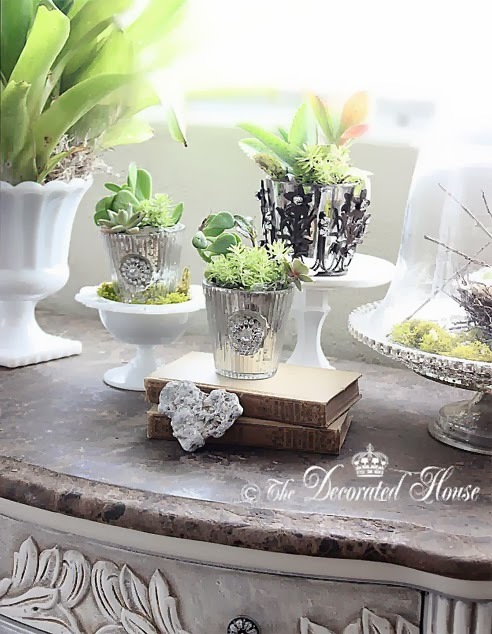 take them outside and bring in some of new succulents that have been outside instead. Rotating the plants will help keep them all healthier. 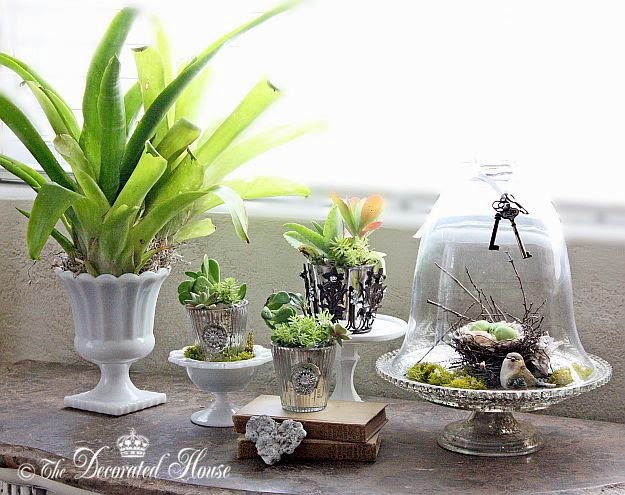 Gorgeous vignette using your mercury silve votives and succulents, dear friend!!! I was just trying to decide where to use my soft green mercury votives. You have given me many ideas with this post. Thank you for always inspiring me!!! I hope you are having a wonderful weekend! 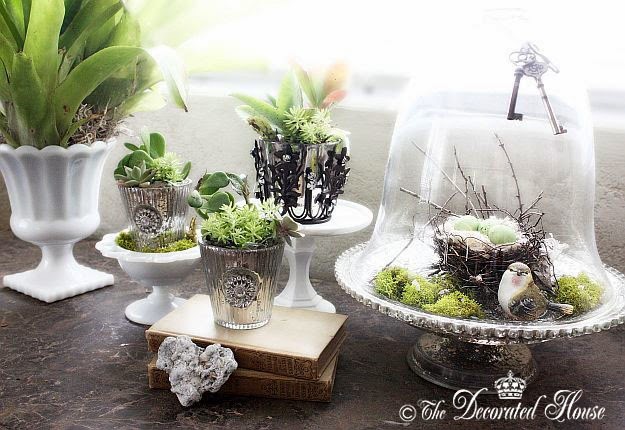 Ooooh, green Mercury glass would be so pretty with succulents! What a great idea. Thanks for stopping by.